The development was built in the early 1990s – around the same time that we opened our Banbury office. At the time we helped one client to purchase five 1 bedroom apartments as we knew they would let easily and provide a good return. 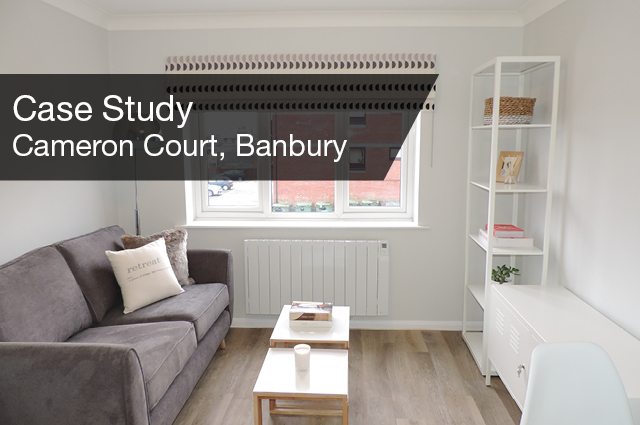 This development remains a good investment to this day; 1 and 2 bedroom apartments in Banbury are always popular with tenants as it is more affordable than living in Oxford city centre and the transport connections in the town are excellent. When the owner wanted to dispose of the apartments 10 years later we helped him to sell all five to a landlord looking to invest with tenants in situ. They provided such a good return that the landlord bought a sixth apartment in 2010 and had planned to upgrade it before letting it out, but it let immediately to a tenant who ended up staying for six years. When the tenant gave notice to leave in 2016 the landlord decided to sell this apartment and asked us to find an investor looking to purchase. At the time we were working with an existing client of our North Oxford office who was looking to buy another property and we advised him to purchase this Cameron Court apartment. As the tenant had been in for six years it was due for an upgrade and we recommended smartening the apartment up to command a higher rent. The client viewed the property, bought it and spent around £20,000 refurbishing it throughout. As expected, when we listed the property we received a flurry of enquiries and it let on the first viewing at £695pcm – the highest rent ever achieved for Cameron Court, giving the landlord a 6% return on his total investment. If you are considering investing in property or need to sell your investment – even if you are not an existing Finders Keepers client – then call Emma or Clare on 01295 276766.